Just hours from completing this year’s summer road trip we enjoyed a great dinner in a midwestern diner at the Cedar Country Cooperative’s Exit 45 Restaurant. I enjoyed an open-faced hot turkey sandwich with mashed potatoes and gravy. I only wish I had space for a slice of their awesome pies! Check out links from their Facebook page for photos. The welcoming homestyle cooking, however, couldn’t have clashed more with the offensive messages of some of the stickers for sale in the gas station’s market. 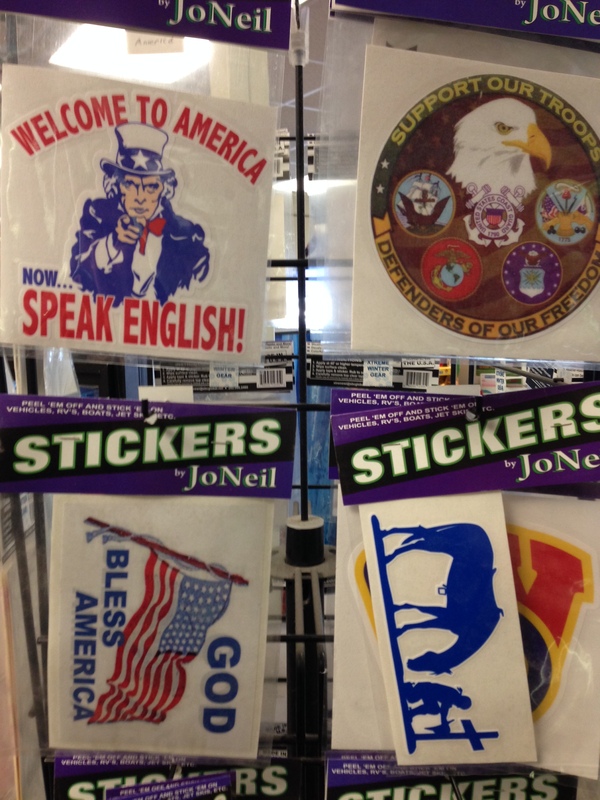 A sticker rack featured bumper stickers with “Welcome to America, Now…SPEAK ENGLISH” and “Speak English or Get the HELL OUT!” I could only wonder what the Hmong family shopping there, or the half dozen Somali men I saw there must have thought. A manager wasn’t there, so I shared my thoughts with one of the employees. Hoping to make a point in a way that might make my point clear, I reminded her that this is America and there is no place for this kind of offensive sentiment. The company that makes the stickers, “Stickers by JoNeil” does not appear to have a web presence. I would really like to contact them to have them make me understand how their selection of God, Troops and Cowboys relates to speaking English. I would hope that the owners of the Cedar Country Cooperative and Cenex Gas Stations would figure out how it is that their product purchasing team ever thought that selling this kind of xenophobic nationalist crap was ever a good idea. I would also remind them of an excellent joke that was once told to me. Q: What do you call a person who only speaks one language? Well, for the uneducated liberal with no sense of humor or loyalty to our nation, you could have simply read the backside of the sticker’s packing for the contact info. There is a website and phone number. Look up the words “xenophobic,” “nationalist,” and “crap” and read carefully. You can laugh at my sense of humor and then get your own blog. My America is bigger than yours.